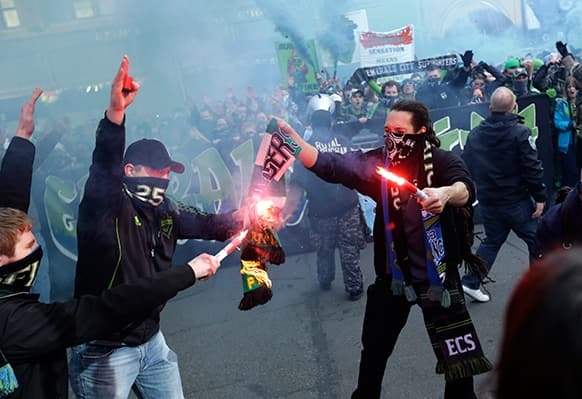 Seattle Sounders fans burn a Portland Timbers scarf during the "March to the Match" before an MLS soccer match, in Seattle. 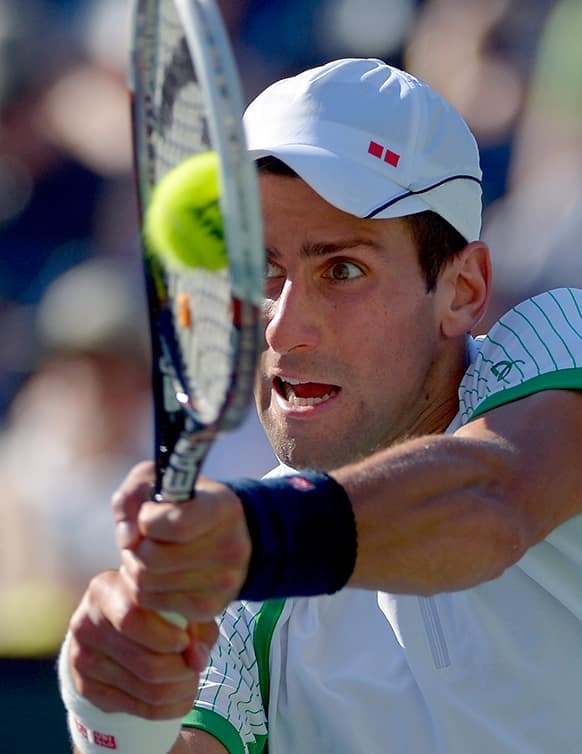 Novak Djokovic, of Serbia, returns a shot to Juan Martin del Potro, of Argentina, in their semifinal match at the BNP Paribas Open tennis tournament. 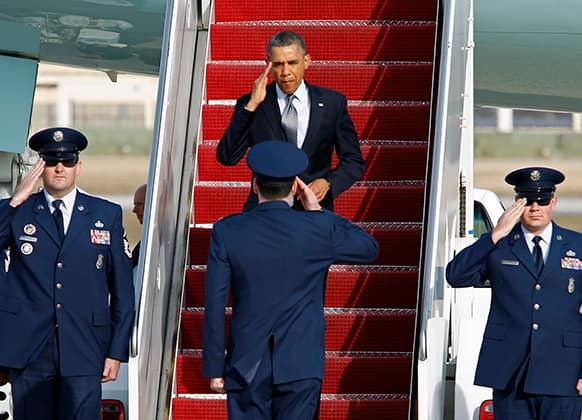 President Barack Obama salutes as he walks down the stairs of Air Force One upon arrival at Andrews Air Force Base, Md. 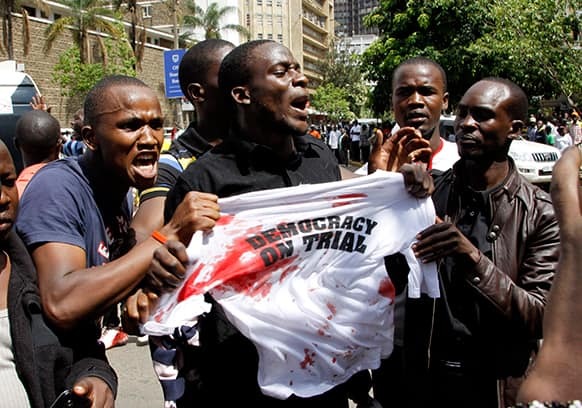 Supporters of Kenya`s Prime Minister Raila Odinga protest outside the Supreme Court as a case is filed over claims of massive fraud that took place during the country`s March 4 election, in Nairobi, Kenya. 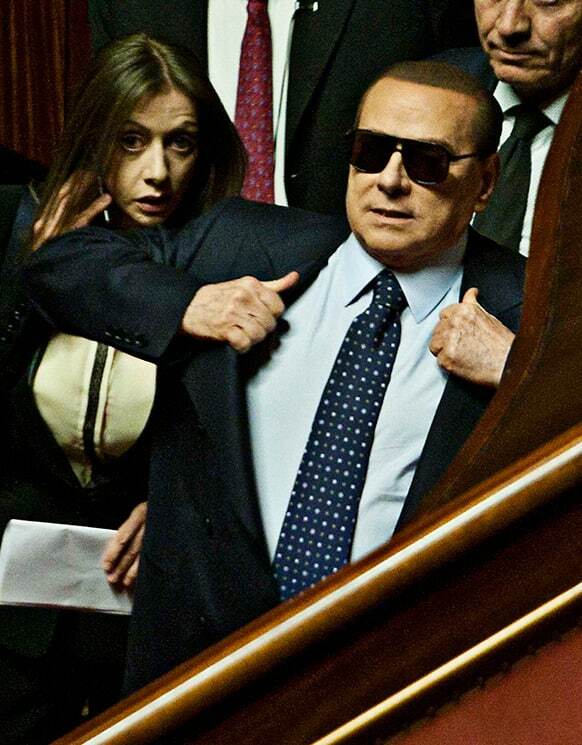 Former Italian Premier Silvio Berlusconi wears sunglasses as he attends the vote operations at the Senate, in Rome. 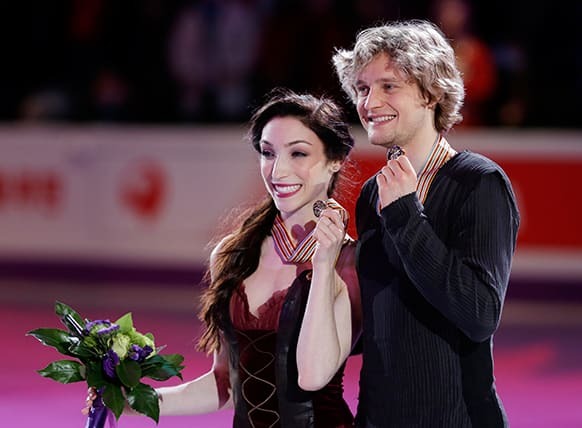 Meryl Davis and Charlie White, of the United States, pose on the podium as they win the first place of the free skate program in the ice dancing competition at the World Figure Skating Championships in London. 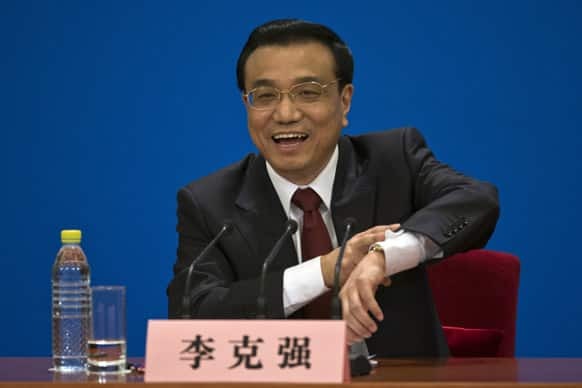 Newly-named Chinese Premier Li Keqiang gestures with his watch while suggesting to end a press conference after the closing ceremony of the National People`s Congress held in Beijing`s Great Hall of the People, China. 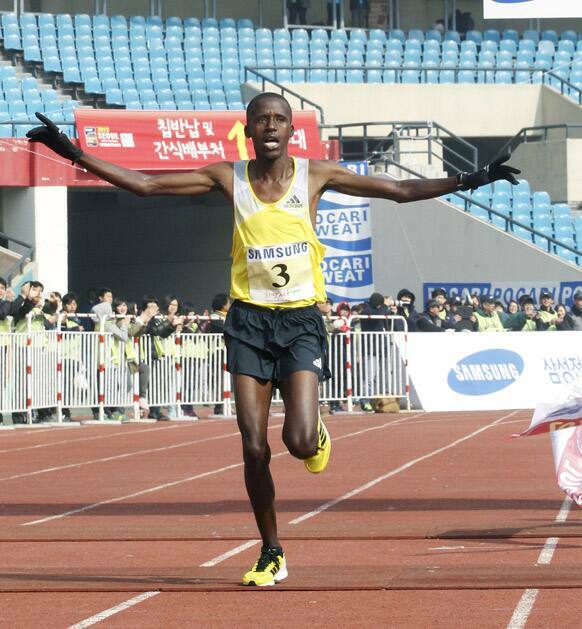 Franklin Chepwony of Kenya raises his arms as he crosses the finish line during the men`s race of the Seoul International Marathon at Olympic Stadium in Seoul, South Korea. 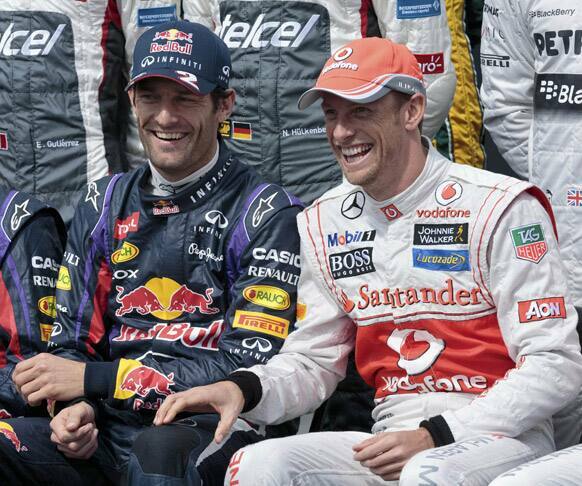 Red Bull driver Mark Webber, of Australia, and McLaren driver Jenson Button, of Britain, laugh during the official driver photo of the Australian Formula One Grand Prix at Albert Park in Melbourne, Australia. 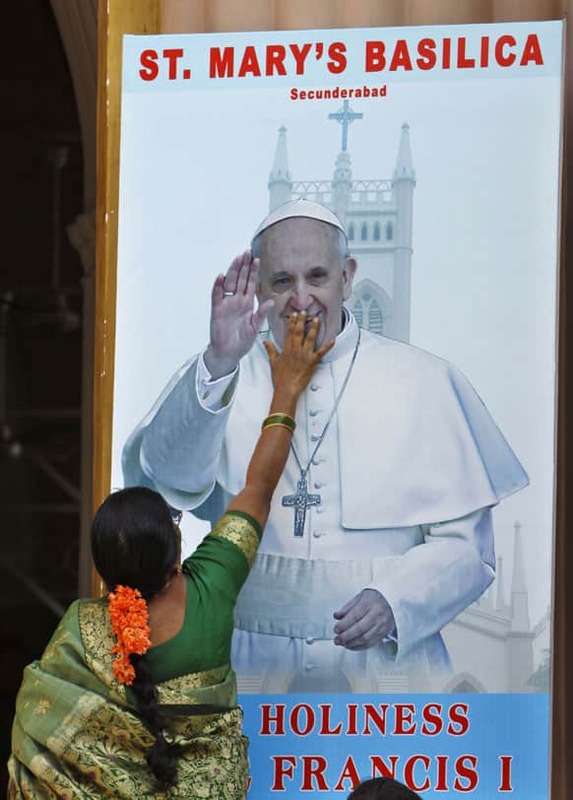 An Indian Catholic devotee touches a portrait of Pope Francis put up at the entrance of Saint Mary`s Basilica in Hyderabad. 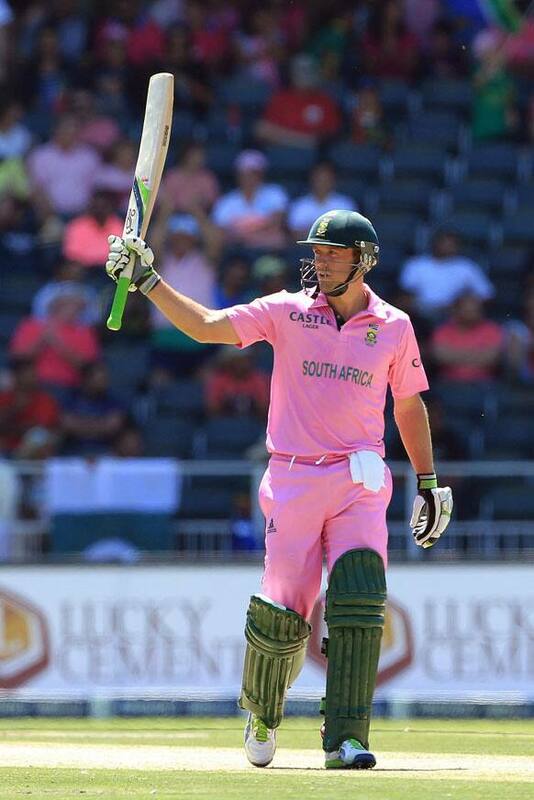 US Coast Guard Petty Officer 3rd Class Tanner Marshall is kissed by a woman during a St. Patrick’s Day parade, in Savannah, Ga. St.
South Africa`s captain AB de Villiers raises bat after reaching his half century during their 3rd One Day International cricket match against Pakistan at Wanderers stadium in Johannesburg, South Africa. 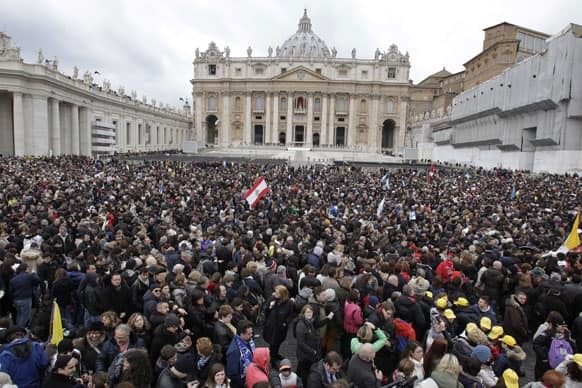 Visitors gather in St. Peter`s Square at the Vatican, before the Angelus prayer by Pope Francis. 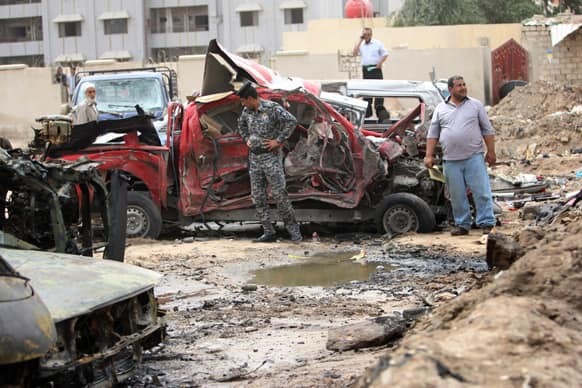 An Iraqi policeman and civilians inspect the site of a car bomb attack in Basra. 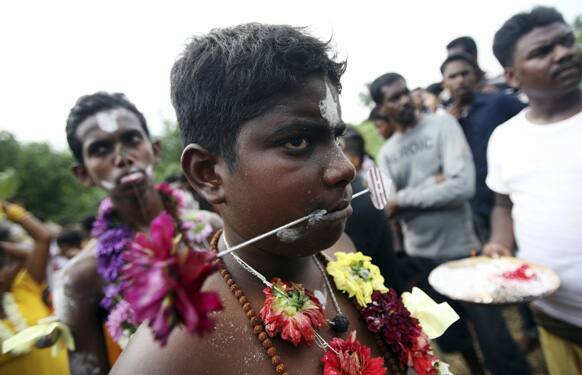 A worshipper has his cheeks pierced during the Tamil Hindu festival of Panguni Uthiram in Langkat, North Sumatra, Indonesia. 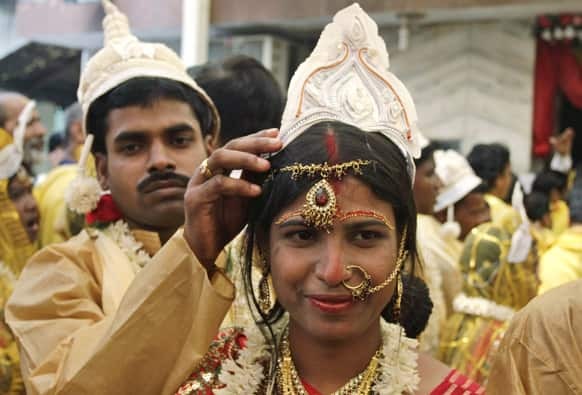 A groom adjusts the headgear of his newly married bride during a mass community marriage in Kolkata. 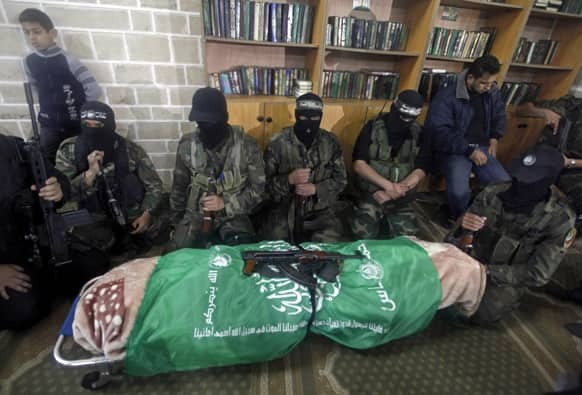 Masked Hamas militants knell next to the flagged-draped body of Hamas member of the Palestinian Parliament Mariam Farhat, 64, who died early Sunday at the Gaza hospital in Gaza City. 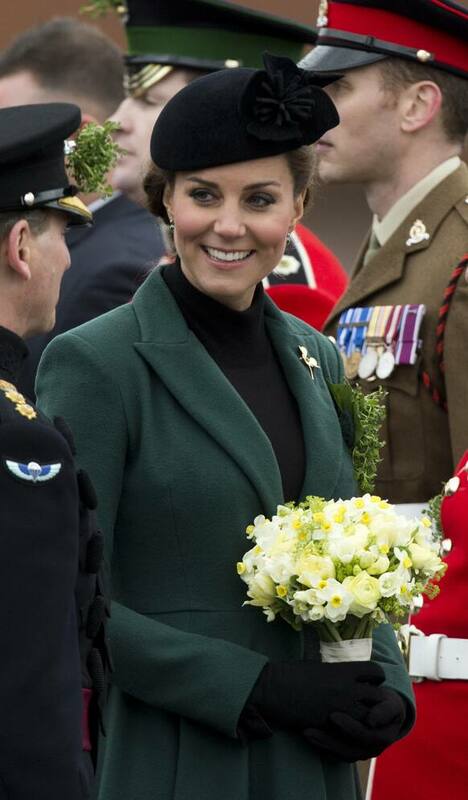 Britain`s Kate the Duchess of Cambridge holds flowers after presenting traditional sprigs of shamrocks to members of the 1st Battalion Irish Guards at the St Patrick’s Day Parade at Mons Barracks in Aldershot, England. 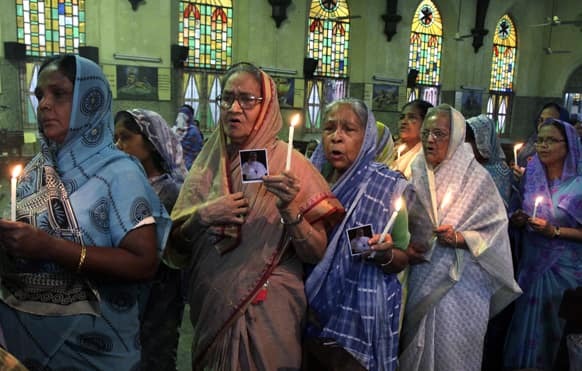 Elderly Indian Catholic women hold candles and photos of newly-elected Pope Francis during a thanksgiving mass at a church in Kolkata.